Register Log In Texas Hunting Forum Forums Rifles, Shotguns & Handguns 224 Valkrie- AR Build underway! We (me + 2 buddies) are building 3 identical AR-15 rifles in 224 Valkrie. 22" Wilson Combat barrels, 1:6.5" twist. I have 1000 pieces of Starline brass and 3500 bullets of the 75 grain ELD-M headed our way. Barrels, AR upper parts, and ammo components will be here Wednesday and Thursday. We plan on shooting the 75 grain ELDM about 2900 fps. I have been wanting to build a new suppressed .224" caliber rifle that is hotter than the normal 223/5.56 round to shoot the heavier 75+ grain bullets faster. We decided on the 224 Valkrie. Anyone reload for the 224 Valkrie? I have done a few rounds from standard reloading sources, but do not have any actual field data yet with the 75 grain bullets. I'm looking forward to this project and build! Once ready, we are talking about planning a prairie dog trip. 223 Rem bolt gun, 224 Valkrie, and 6.5x47 for longer range stuff. I did build a cabin. Aka the brokeback shack. Over twist much? I hate this trend that has started. That'll be a fun little monster to shoot...enjoy it Chad. You know the powder to use. Go find pressure. I'm soooo skeptical about this caliber. By no means am I trying to intentionally stroke your/yall's egos, but..if you/yall can't make this caliber work then I'm going give up on it forever. The only person one I know personally that I'd deeem a "gun/reloading" guy who tried gave up on it. Couldn't really get the heavier 80-90 grains bullets to work with anything in his set up. The 65 to 70's, he getting such bad results at higher loads, ie speeds, that it didn't seem worth it to him. Well, I want to have options for the 88 grain ELD-M also, which needs a 1:7" twist. Wilson only has 1:6.5" twist for the 224 Valkrie, which I think is great. It allows for the heavier bullets, if you want. And (which I think is the best option) the faster twist allows for easier and more consistent bullet expansion and more nasty wound channels. I'll try the 75 and 88 grain ELD-M's on critters of all sizes and see how she does! KR, need more info on the details on why it didn't work. Rifle set up, bullets and powders used? Factory ammo? I have heard first hand from customers about the issues with some of the factory ammo being slower and not very consistent. Consistency is what is needed when promoting a 1000 yard capable .224" round. My friend mostly shot reloads. For what it's worth, he would admit he's no expert in shooting, ar building or reloading. But he, like I, have been able to make some setups shoot very well. When we chatted, he was just confused as to why he couldn't get this one to go as we were comparing my grendel results vs his valkyrie. Definitely a 7 twist barrel. I don't remember the manufacturer but seemed reputable enough. It was 22" with something that wasn't muzzle threaded, ie no muzzle device. I gave him about 30 75gr amaxes I didn't want anymore. I know he tried one of the really heavy Barnes bullets, he loves Barnes bullet. Don't know what else. Don't remember powder but he used a couple of what he had and he bought a single pound of something he was recommended. So very limited here, so, we both thought here is where it seems like it needs more expertise, specific powder selection. BTW, we concluded we liked the grendel better because it seemed to be more "forgiving" of powder selection. We theorized that Valkyrie maybe one of these calibers that if you hone in the right combination of powder charge and selection. I think that might even mean that this caliber will only be good for powders that are temp sensitive. Obviously the grendel is not a "1000 yard" caliber but I haven't met a single person that has one that can out shoot my grendel at 300 so I must remain skeptical until i do. it's usually complaints about how bad it performed. Analogy: Yes a ferrari F1 is certainly faster than my sedan in theory BUT you can't find racing fuel in Katy and there is a speed bump between my home and office so what do I care if my sedan gets me home faster? In short he develops loads like Buzz? There certainly are a few tricks to getting an AR to shoot well. If you know what you are doing, it's not that difficult. I have full confidence in finding a great load with some 75 grain ELD-M's. I can take a $2500 custom AR and make it shoot like crap with the wrong combo. I can take the exact same rifle and make it shoot 1/2 moa with the same bullet by changing to the right powder and burn rate. AR's can certainly be more finicky than a simple bolt gun. But once you understand it, it's not that hard. Most people go too aggressive with their bullets and powder burn rates. They look only at what powder yields them the fastest speeds. Often times that high velocity is with the wrong powder to shoot well in an AR. But it goes fast! What is the difference between the 224 Valkrie and a 224 Grendel? Ever spit it out rather than swallow it? Enjoy it while you can. One day you might be complaining about NOT getting random pop-ups in the morning. So a 224 Grendel would be a little faster? Not sure what others are talking about but I meant my 6.5 grendel was a better choice than my friend's 224 valkyrie. Is there such a thing as 22 grendel? Couldn't find the case capacity for the .224 Valkyrie. It is based on the 6.8 SPC I think. Buzz reloading is a powder charge that has worked for other people, but he doesn't do any testing in his own rifle. I have no idea. I’ve just been reading about the 224 Grendel and how much people are liking it. The 22 and 6 Grendel have interested me for a while, AR performance sells his barrels with custom Hornady full length dies. You can also use Redding bushing dies and barrels available from several sources. But I haven’t convinced myself to build one yet. I built an upper with a BHW 6x6.8 barrel a few years ago, used CH4D full length custom dies. With an 18” barrel I was getting 2950-3000fps with 85gr bullets IIRC. Got bored and sold it.. The nice thing about the 224V is barrels, brass, factory ammo, dies are all readily available. I had my best results with 2000 MR /Varget/ and your favorite Reloder 17. Was visiting with a couple of FClass shooters in Mississippi who also said 2000 MR was the cat’s meow for tha Valkyrie. Mine shot well enough that a friend who watched me shoot it took it home.....He called and said come by his office and instead of the rifle he gave me a check. "Anyone taking up handloading necessarily plays with unknown factors and takes chances. But so does anyone who drives a car,goes to a cocktail party,eats in a restaurant,or gets married." I think a lot of people are missing the mark on what 224V could be useful for. It could be a very good training tool: relatively cheap ammo, long heavy bullets, low recoil, and supposed to be pretty long barrel life. Can you answer about using the ELD-M’s. I thought this style of bullet has to be seated so far back in the case to fit in the mag, it hampers powder amount. Also, you’re right in that AR’s can be a little finicky to load for, but not a big deal to get around. For instance, I have a IMR 4198 and 55 grain Varmageddon load that is super accurate and soft shooting, but won’t work with rifle length gas systems. Not enough oomph to cycle the bolt. Last edited by tenyearsgone; 04/16/19 01:40 PM. The 224 V is based (loosely) on the 6.8 SPC case. It has the same exact case head size as a 6.8, so you can use a 6.8 SPC bolt carrier for the 224 V. But you can't simply neck down the 6.8 to .224" and get the long heavy .224" bullets to fit in an AR mag. The bullets would have to be seated much too long. So the design of the 224 V is to use the 6.8 case, shorten the case length and move the shoulder back some. 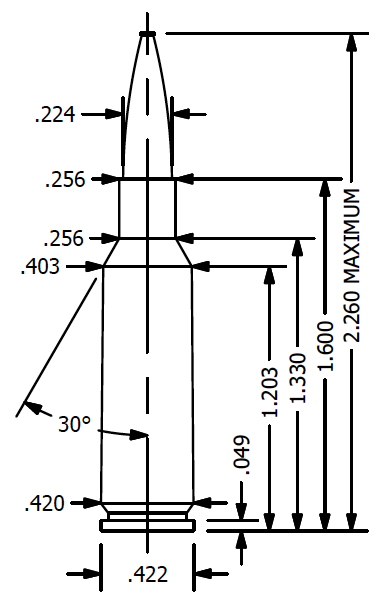 The shoulder on the 224 V is .1" shorter than the 6.8 (1.3-1.203"), and the overall case length is shorter by .075" (1.675"-1.6"). This will allow the long .224" bullets to fit in an AR mag, and be seated in the case properly. It's the same exact concept the 6.5 Creedmoor did compared to the 260 Rem (as far as the shorter shoulder and shorter case length goes). And the 224 V has the optimum 30 degree shoulder angle, where the 6.8 has a 23 degree shoulder angle. Some of the newer rounds being developed now are being designed to accommodate the heavy and high BC bullets we are seeing now. The reason why the 6.8 round is a great choice for an AR, is the lighter weight 270 bullets (.277" diameter) have a real short ogive to tip length. This will allow them to be seated out long, have more powder capacity inside the case (means more speed) and still fit and feed in an AR. Last edited by ChadTRG42; 04/16/19 02:26 PM.